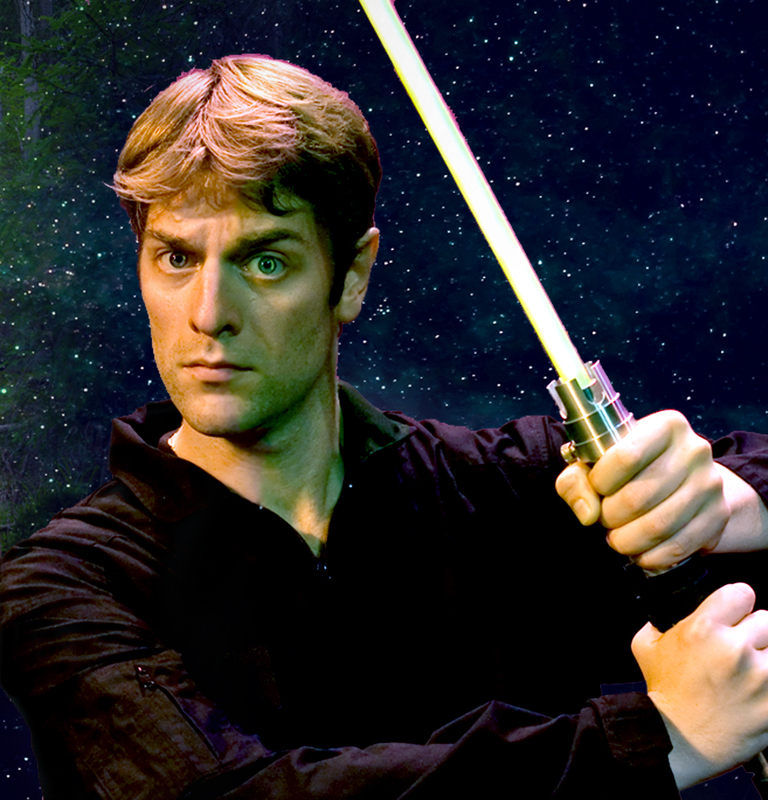 On Saturday night, Charles Ross brought his electrifying—and aptly named—show, “One-Man Star Wars Trilogy” to our very own Ware Center in downtown Lancaster. A nearly sold-out crowd of all ages came to see Charles Ross singlehandedly perform the entire “Star Wars Original Trilogy”. At first, the idea of one man condensing and performing 385 minutes of classic lines and unforgettable characters in about 60 minutes seems a little far-fetched. Does he work with sets? No. Are there costume changes? No. Does he use props? No. Incredibly, Charles Ross is able to reenact the entire “Star Wars Original Trilogy” with just his vocal cords and a wild imagination. Ross’s performance was wildly entertaining, hilarious, and very high-energy. Ross was able to capture the multitude of sound effects, character voices and action sequences of each film. Clothed in a dark grey jumpsuit: Ross beeped like R2D2, whined like Luke Skywalker and swaggered like Han Solo. Ross gave an incredibly physical performance; he threw himself around the stage, rolling, jumping and crumpling to the ground—whatever the plot required. Special praise must also be bestowed upon the Ware Center’s lighting crew for their incredible use of lighting design to elevate Ross’s performance. Charles Ross opened his act with a performance of A New Hope, beginning with Darth Vader’s attack on Princess Leia’s ship and ending with Princess Leia bestowing medals of valor upon Luke Skywalker and Han Solo, post-Death Star explosion. In a span of about 20 minutes, Ross reenacted the whole movie in without missing a beat. Ross applied the same pattern to the next two movies in the trilogy—The Empire Strikes Back and Return of the Jedi. The performances of each film were equally amazing—and exhausting for Ross. A five-minute break separated each performance; the breaks gave Ross a chance to catch his breath and interact with the highly entertained audience. After his show on Saturday night, Charles Ross grabbed two bottles of water, wiped the sweat from his brow, and plopped down on the Ware Center stage to give the audience the history of his show. Ross told the crowd that, since 2001, he has brought his act to over 500 cities around the globe, performing over four thousand shows. Ross first tried out his skillfully executed, smart “Star Wars” material at club in Toronto 14 years ago—it was an immediate hit. The ”One-Man Star Wars” show garnered more and more positive media attention until one day; representatives from Lucasfilm Ltd contacted Ross. These representatives were very interested in forming an official partnership with Ross and his show. Ross attributes the longevity of this particular show’s run to his partnership with Lucasfilm Ltd.
Charles Ross’s “One-Man Star Wars” is a performance every “Star Wars” fan should witness at least once in their lifetime.